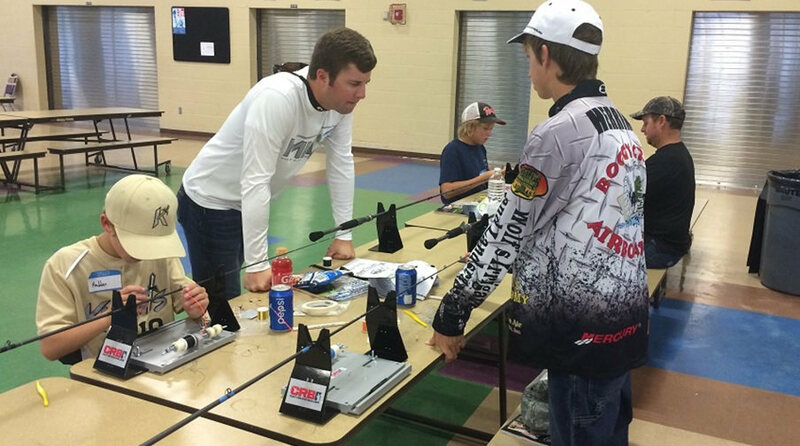 You just built your rod, applied the epoxy to your guides, and left it spinning to dry in your rod dryer. However, the epoxy never seems to finish drying. Most epoxy brands are a 50/50 blend of resin and hardener that need to be mixed, and mixed accurately. If you are not extremely accurate, the epoxy may never dry. Also, when you mix the epoxy, you want to do so slowly to eliminate any bubbles. This process will take several minutes, so be sure to follow the manufacturer’s guidelines. Never try to whip the mixture like you are making scrambled eggs. Once mixed, pour the epoxy in a flat foil mixing dish prior to applying. This helps reduce the air bubbles as well as keeps the epoxy in a usable state longer. A little patience during this phase goes a long way. Why do we need to prep the guides before wrapping? 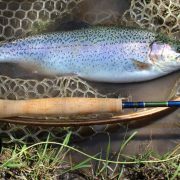 If the guides have not been properly filed down, the thread often snags during the transition from rod blank to guide foot, or worse, a rough guide foot can even scratch the rod blank, causing damage later on. To properly prep your guides, use a small file and work the end of the guide foot so that it comes to a point. 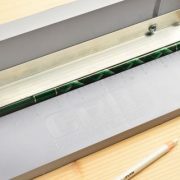 Then, take a piece of light sand paper and buff the underside of the guide feet to ensure it is smooth, and be sure to check one last time and remove bits or burrs in the metal that could scratch the blank. 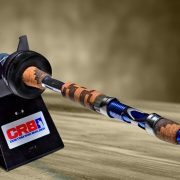 Next to Finding The Spine On A Fishing Rod Blank, wrapping your rod guides on the blank is one of the most important steps in custom rod building. 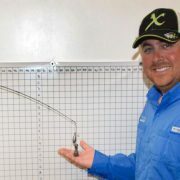 When not done correctly, the overall performance and stability of the rod may be compromised. Some thread is made strong just for wrapping, and some thread is made purely for aesthetics – and usually lacks the strength and rating to be used for wrapping guides. 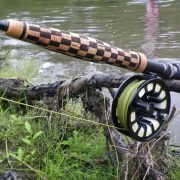 For example – in the ProProducts product line – ProWrap Nylon and Color Fast have strong tensile strength and are perfect choices for guide wraps. While ProWrap Metallic VersaBlend, Metallic, and Metallic Braid are used for decorative applications like under wraps, trim bands and overwraps. Just make sure you are using the right thread for the job. When you need to trim wrapping thread, try not to use your razor blade like a saw. Instead, take the razor blade and lay it flat on your wraps right next to where the tag end comes out from under your wraps. Then take the tag end and pull towards the razor blade, cutting the tag end flush to your wraps. When you try to use your razor blade as a saw, it could possibly damage your wraps. While this may not be the end of the world, it would most likely require you to start over again. 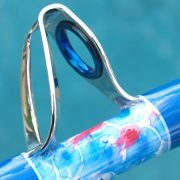 Have you ever put a decal on your rod – then realize your finger prints or a piece of hair is stuck underneath? Well, here is a process that will eliminate that issue, and can be used on custom, monochrome, or any blank decal. First, perform any trimming you desire around the decal lettering or images. Then, with the decal facing up, place tape over the entire length of the decal – extending about a half inch longer on each side. 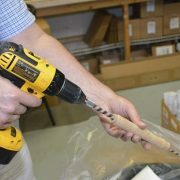 Basically – we are creating “tape handles” on each end of the decal so we do not need to grab the decal itself latter. Next, flip the decal over, and use a piece of tape adhere to the decal backing. Using this piece of tape, slowly remove the backing film from the decal. BE SURE NOT TO TOUCH THE BACK OF DECAL. Finger prints (as well as hair, dust, etc…) on the back will show after installation. With the backing removed, grab the “tape handles” and then position the decal on rod blank (or fishing rod) where you desire it to be placed. 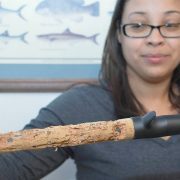 Gently make sure you rub the decal on the rod, and then carefully pull off the tape to finish. Well there you have it. Hope this article was helpful.